There are lots of trading system available over that web that assure you great profit in few minutes of joining and one out of them is My First Online Payday. Unfortunately, just like most of the binary options signal system, it’s also a scam and we recommend you, not to be a part of this program. We have already exposed lots of online trading system and in today’s review is about My First Online Payday. In just a few hours we find out that My First Online Payday by Jeremy Mathews is clearly a SCAM and we don’t have the single doubt about it. So if you’re wondering to invest your money in this trading system, we recommend you to read our review first, as you’re going to save lots of your money which you can invest somewhere else. Even we’re shocked because all the Beta Testers accompanied with CEO of this trading system didn’t even exist in real life, they are paid Fiverr.com actors. 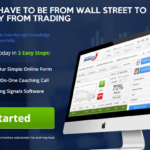 Do you really want to invest money in this money making trading system? Keep reading and we will clear all your doubts with the proof which we gathered about this binary signal trading system. 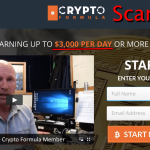 No doubt the law breakers behind this scam trading system really are on very tight budget and we’re sure that the trader who’re into this business will find out that this auto trading system is a scam just by watching a video full of lies and cheap design of the website. So without wasting single seconds, let’s get straight to facts which force use to call this trading system a Scam. Recently, we have also posted reviews about many scam softwares like Zulander hack scam, push money app scam. What is My First Online Payday? My First Online Payday is binary options system created by Jeremy Mathews. According to the information of the trading system portal, they know have cracked the Binary Options trading system that helps you to earn more profit. Actually, they have discovered a loophole that reduces your risk of losing and increase your rewards. They provide you amazing customer support if you have a question they have got answers for you. Even they will provide you $50 to get started. So you can play with this money and earn more profit. Note: All these Features are mentioned on the website of the My First Online Payday. We’re not confirming all these features. Now it’s time to discuss with you all the fact which we noticed while doing deep research on My First Payday Online. We don’t even find a single thing which is true. Why My First Online Payday is a Scam? Because We have Proofs! Jeremy Mathews is the alleged CEO of the My First Online Payday. 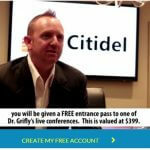 He’s the same man who appears in the video demonstrating the binary options signal system. After doing a research about him, we find no trading history of this man and no social media profile. What we found about Jeremey Mathews is the Fiverr.com profile where he mentioned himself a testimonial actor who charge only $5 to be your British spokes personal. Do you really want to invest your hard earned money in this trading system whose CEO is a paid actor? I’m sure you would not. Keeping reading, our research didn’t end here. 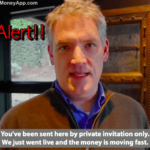 Any Tan and Rebecca Martinez along with another beta tester of this binary trading system is giving the fake testimonial about the My First Online Payday. All of them are testimonial actors and they are not associated with this binary options signal system in any way. Even you’re an experienced trader and watched testimonial of other trading systems you will definitely know Rebecca Martinez who already featured on lots of fake binary options sites. When you visit the My First Online Payday. 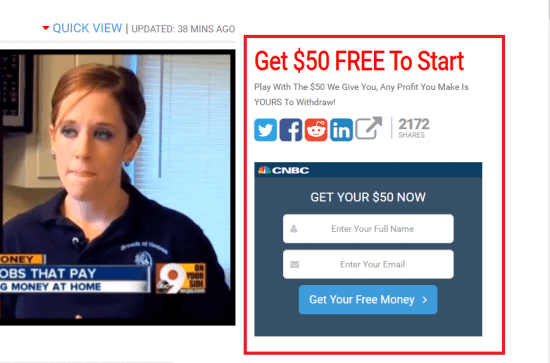 You will see a form with a message that Gets your $50 and starts playing with it to earn more profit. Actually, you will get nothing when you will the form. As your account get locked and you don’t have the power to withdraw it until you earn some profit using this binary options signals system. Now this is very misleading to users. When you visit the website and try to click on videos, links, and even on social media buttons. You will notice that all of them are not clickable. All the stories on the Portal are fakes. 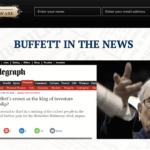 The website looks like new channel site, but actually, it’s fake website full of cheap content. After reading all about the CEO of the company and all the beta tester of the My First Online Payday trading system. Do you really thing ABC News will feature this fake actor on their set? Hell No! New traders can do this mistake but ABC News will never do this. After doing deep research about My First Online Payday, We discovered that it’s a trading system full of Scam and Lies. 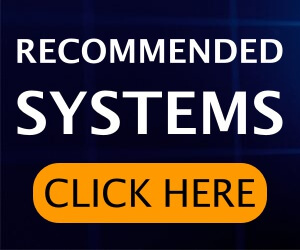 So Binary Signals Advise don’t recommend you to be the part of this binary options signal system. In case any of the readers already joined this trading system we will love to listen from them the reality of the My First Online Payday. We recommend our readers to use any other legit and trusted softwares like virtnext software.